We offer both Veka and Solidor Composite doors - both are very good and very secure. Our VEKA Composite Doors are a stylish combination of elegance, security and durability. With a myriad of modern and traditional designs at your fingertips, our doors require little or no maintenance and they are warp, twist or bow resistant. Our Composite door system offers high dent resistance and up to six times more heat insulation than a timber door. Say goodbye to your old door problems and take advantage of the wide range of benefits associated with our doors including the Association of Chief Police Officers' (ACPO) coveted Secured by Design accreditation. You get a beautifully stylish door with a virtually endless choice of styles, colours and woodgrain effects combined with matching outer frames. "Great attention to detail and listens to what is requested. Owner and fitter very pleasant to deal with, would thoroughly recommend." They are Low Maintenance – so there is no need for painting or varnishing. An easy to clean surface just needs an occasional wipe with a damp cloth to keep it looking as good as new. The doors are warp-free and weatherproof throughout their long life. And because they manufactured to suit a triple sealed outer frame ,they are an end to drafts. The super-efficient insulating inner core and a thermally efficient threshold saves energy and money. Our highly secure door locking ranges are designed to keep out more than just unwanted noise and weather They are, tried and tested to resist even the most persistent burglar and offer all the protection you need. Our highly secure VEKA composite door system has been independently and vigorously tested to ensure it complies with the all the important quality standards, including PAS 023 and 024 and it has achieved the coveted "Secured by Design" designation as well as meeting the requirements of Part M of the Building Regulations. Every door in the our wide Veka can achieve a U value of 1.6 – in fact many styles go much further and reach an impressive U value of just 1.0.! 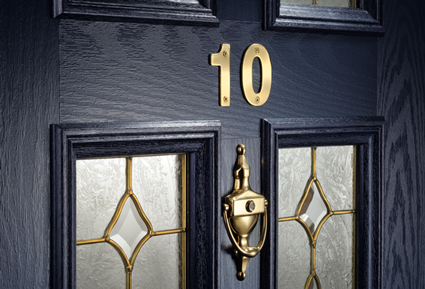 At Bahama we can fulfil your need for a high performance, quality composite door backed by a cast iron guarantee. Click to download our VEKA Composite Doors Brochure.